There’s nothing quite like the smell of freshly-cut mint and freshly-squeezed lemon to brighten up a kitchen after a long hiatus of take-out. One can only take so much pad thai. This salad comes from the Williams-Sonoma Book, “Salad of the Day,” which I received over the holidays. I’m just getting around to testing it out now. Let’s just say things have been a little busy. Anyway, get that grill (or grill-pan for all you indoor cats) going and enjoy this spring salad! Put asparagus and zucchini in a heat-proof bowl, pour boiling water over to cover, and let stand for 2 minutes to soften slightly. Drain, let cool, and toss with the 1 tsp oil. When the grill is ready, put the bulgur in a heatproof bowl and add boiling water to cover by 2 inches. Let stand for 10 minutes. Meanwhile, grill the asparagus and zucchini, turning often, until lightly browned and crisp-tender, 4-5 minutes. Remove to a platter and cool slightly. Cut the asparagus spears on the diagonal into thirds. To make the dressing, in a bowl, whisk together the lemon zest and juice, cumin, turmeric, cardamom, 1 tsp salt, and several grindings of pepper. Add the 2 tbsp oil in a thin stream, whisking constantly until the dressing is smooth. Pour the dressing into a saucepan, add the chickpeas, and warm over medium heat for a couple of minutes, stirring occasionally. Drain the bulgur. Combine the bulgur, grilled vegetables, green onions, mint, parsley, and chickpeas with the dressing in a serving bowl and toss to coat evenly. Serve warm or at room temperature. 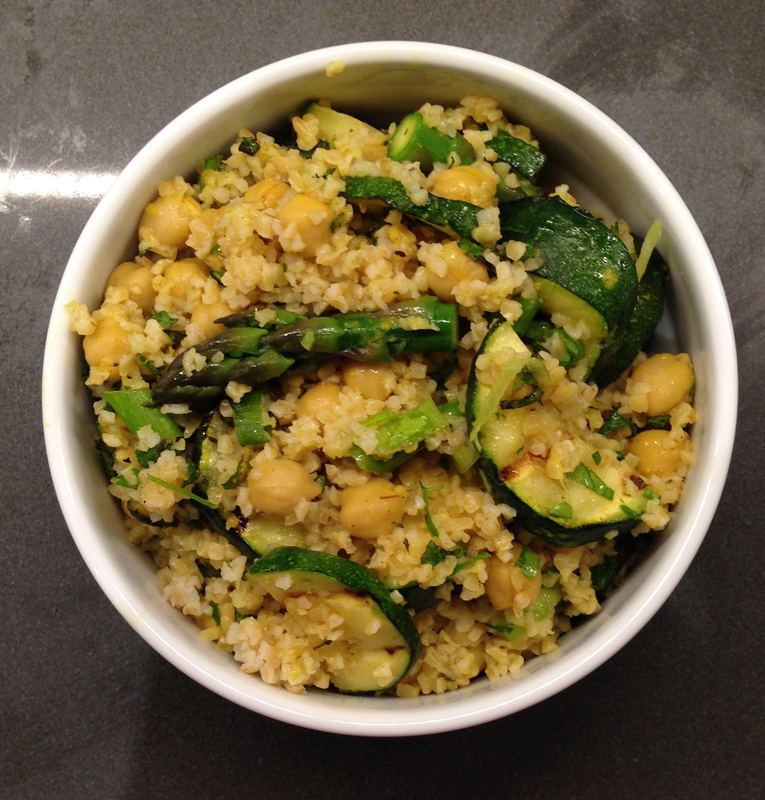 Pingback: Bulgur Salad with Zucchini, Asparagus, and Green Onions | 2016: Our SALAD Year!